This wine begins with grapes grown in Viña San Pedro’s most prized vineyards in the Casablanca Valley (87%) and the Elqui Valley (13%). Both of these valleys receive the important influence of the cool the Pacific Ocean, which results in an ideal cool climate that allows the grapes to ripen slowly. The vines are trained with vertical trellis systems and drip irrigated. Alcoholic fermentation took place using selected yeasts and controlled temperatures. Of the blend, 50% was fermented in oak and the remaining 50% in stainless steel, giving freshness and fruitiness to the final product. 20% Malolactic fermentation adds richness and the wine aged in French oak for 6 months. This Chard was awarded a Silver Medal in the Concours Mondial de Bruxelles 2016. It shows ample volume, with plenty of fruit and freshness. 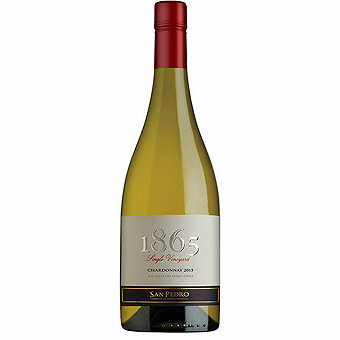 Creamy, balanced and with a vibrant acidity on the palate, with the fruit coming through once again. An intense, complex and persistent finish.